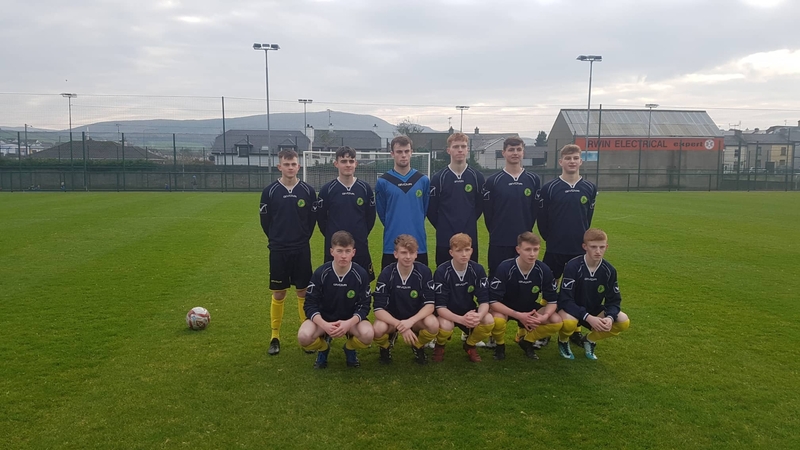 On a perfect day for football, a strong second half performance from Inishowen helped them top the group in the FAI Youth Inter-league competition with a deserved win over Donegal at Maginn Park on Saturday afternoon. The win for Paul Doherty's men followed an opening 5-3 win over Mayo and it means they will have a home draw in the quarter-finals. Donegal must now defeat Mayo in the final game to ensure progression to the knock-out stages from the three team group. Donegal started the better but did not overly trouble home netminder Cathal McNutt and it was the home side who had the first chance of note on 12 minutes when a Nathan Harkin free kick found centre half Adam McCarron and he put his header wide when he ought to have hit the target. Indeed McCarron and his defensive partner Ryan McColgan were superb throughout and limited a Donegal attack who lacked incisiveness in the final third despite some pretty attacking football at times from Eamon McConigley's charges. Inishowen though wasted anther chance to open their account on 31 minutes when Adrian Donaghey-Doherty did well on the left flank before finding Mark McFadden at the back post but he could not convert. Donegal came closest through a Jason McDaid effort on 41 minutes as the sides were deadlocked at the interval. Donegal started the resumption the better and McDaid again came close on 47 while McFadden whizzed one just wide on 50 for Inishowen before the impasse was broken on 59 minutes through Harkin as his shot took a wicked deflection giving Dunfanaghy Youths keeper Oisin Cannon no chance in the visitors goal. Inishowen pushed on from that and added a second on 71 minutes when following a quickly taken free kick from Harkin as he found McFadden who squared for sub Conor Gillen who made no mistake from 6 yards out. McFadden came close again when beating the offside trap but his effort was smothered by Cannon before Donegal came close to reducing the arrears on 84 minutes. Carlos O'Reillys teasing low cross was begging to be scored with the ball just eluding the energetic Eoin Logue at the back post. That moment could have made things interesting for the dying minutes of the game but it was Inishowen who went straight up the pitch to score again when Aaron McDaid converted after Cannon did well to deny Killian O'Rourke initially before O'Rourke turned provider for McDaid. A disappointing afternoon for Donegal who have a chance to progress and they will regroup ahead of that home clash with Mayo in Ballyare in early February. Inishowen: Cathal McNutt, David Henry, Liam Grant, Adam McCarron, Ryan McColgan, Killian O'Rourke, Adrian Donaghey Doherty, Nathan Harkin, Paddy Curran, Aaron McDaid, Mark McFadden. Donegal: Oisin Cannon, Oran Winston, Gavin McGee, Kyle McMullan, Matthew McLaughlin, Johnathan Coady, Eoin Logue, Carlos O'Reilly, Dylan Doogan, Jason McDaid, Peter Carr. Subs: Luke McCarry for Doogan 57 mins, Jordan Nugent for McDaid 68 mins, Dylan O'Brien for Carr 78 mins.